In 1914, just over 30,000 people lived in the Wairarapa area, from Woodville to Palliser Bay. The urban population was 12,900, while over 17,000 were in rural areas. Farming activities dominated working life. The horse supplied the main power for work and transport. Cars and motorbikes were becoming more common but roads were often rough. Rail was the bulk mover of people and goods. Many young Wairarapa men were already part of the Territorial Army. 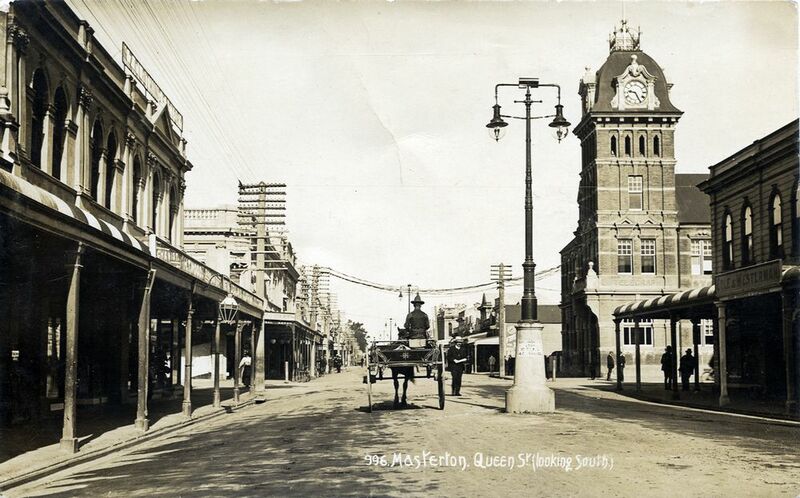 Masterton was the headquarters for Military District 7A, which ran from Waipawa south to Palliser. There was a rush when the Government asked men to volunteer for an expeditionary force (an army serving overseas) supporting Great Britain on the declaration of war on 4 August 1914. The exact number of Wairarapa men who served in World War One is difficult to calculate but is likely to be more than 2,000. On war memorials in the Masterton, Carterton and South Wairarapa districts, there are 543 men and one woman who died as a result of the Great War. Other than military manpower, Wairarapa contributed war relief funds, horses and agricultural products which were needed by Britain. Groups and individuals sent parcels of food and comforts to men overseas. The Great War affected everyone to some degree. Families lost husbands and sons, while returning men, wounded and sick, had to cope with civilian life again. During the Gallipoli campaign, New Zealanders at home first saw long casualty lists, which remained part of daily life until after the Armistice on 11 November 1918.